Have you guys planned out your Easter menu yet? We're keeping things low-key this year, but that doesn't mean that we don't have yummy dishes planned for our holiday spread. We're going to go the traditional route, serving up Easter staples like ham, baked beans, dinner rolls, mashed potatoes. The only thing I haven't settled on yet is a dessert. I'm not really feeling cookies this year, so I am leaning more towards a pie or a cake. Cheesecake sounds tempting, but I'll be making my Dulce de Leche cheesecake for Cinco de Mayo, so that might be too much cheesecake in such a short time period. So, maybe a banana cream pie or fudgy cake? I don't know. What do you guys suggest? 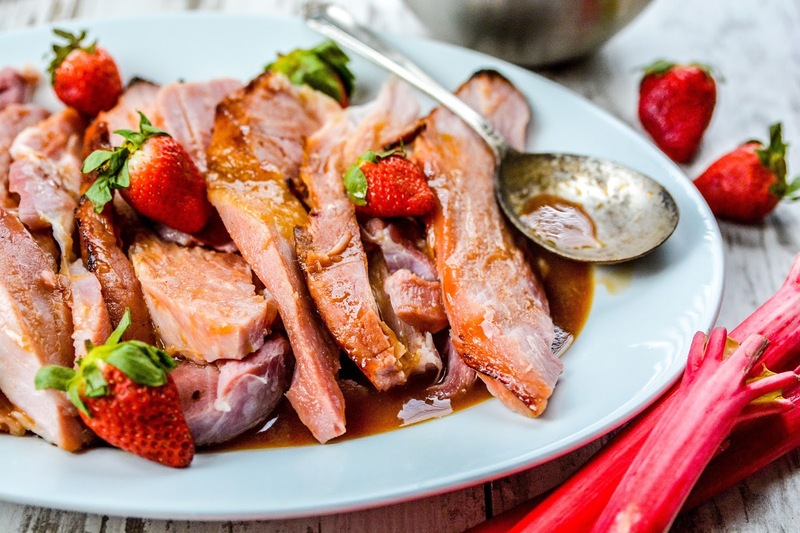 Even though we're having a traditional meal, this year I am skipping the brown sugar glaze that we usually baste the ham in because I found this Strawberry Rhubarb Ham Glaze on Golden Blossom Honey and it sounded too good to resist. I'll be honest here and say that I have never made anything rhubarb flavored. I have always been intimidated when I see it at the grocers because I don't really know how to cook with it. Thankfully, this recipe doesn't use actual rhubarb, but rhubarb flavored jam instead, so I didn't have to give myself a crash course on how to incorporate it into a recipe. I did do a test run on this recipe last weekend, and while I don't eat ham, the rest of the family gave the ham 2 thumbs up. So, if you are looking to add a little new to the traditional, this would be a great place to start this year. What desserts do you have on your Easter menu this year? Lovely range of reds in today's photos. Never had or even seen a rhubarb here, I don't think that anyone even knows about its existence here LOL Is it like onions or what? I'm guessing not as I've seen Julia Child making sweet pies with it. I didn't eat the actual rhubarb but I read that it tastes like a sour green apple. I'll try cooking with it this summer and will report back then. I did forget to tell you I made the millet a few weeks back. Forgot to take a picture and send it to you. We loved it! I'll ask the family if they want banana cake this Easter. They are so damn picky, if it isn't chocolate or peanut butter, they don't want it. pft! I have used paper in my backgrounds before. Actually, that peanut butter cookie picture in my side bar, the brick wall is paper. You have to be careful with it though because if you don't shoot it right, it just looks cheap and trashy. I don't think we'll have much, ham has been cooked once in a while here though for Easter. That is one thing that has never ever appealed to me. It's funny what we snug our noses up to as kids but have no problem diving into as adults. I kick myself for all of the goodies I missed out on back then. We always go to the in-law's house every year for Easter. Mom always makes a ham. I bet if I text her this delicious-sounding glaze recipe, I'd bet she'd do the ham with it! That's a new take on ham! I love strawberry rhubarb pie, but I've never had the flavor on ham before. It sounds divine. My family definitely loved it! 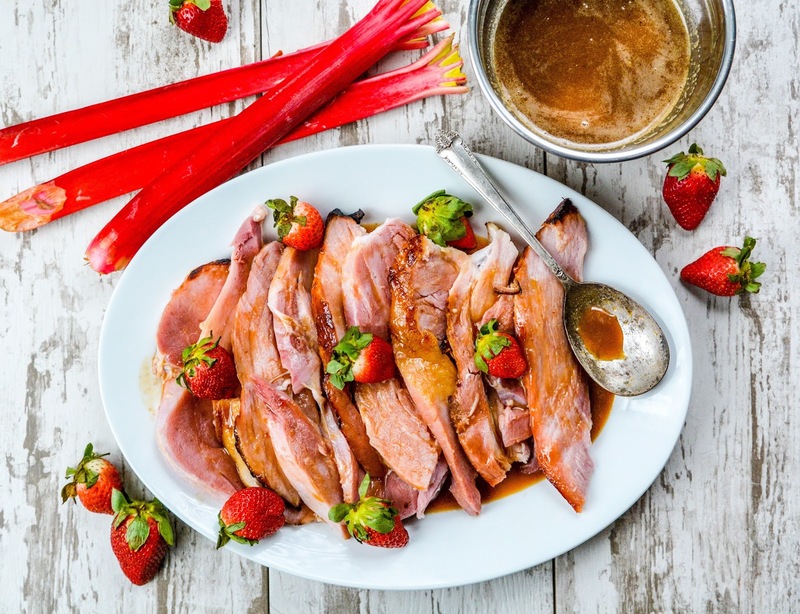 I have to share this recipe with everyone who loves ham and I need to learn how to cook with rhubarb. I will look for rhubarb which seems like a great flavor for many things. I need to learn how to cook with it too. It seems like such an interesting food. I would definitely try that. That's too bad, Adam. You have such a lovely family, a big Sunday meal would be a nice way to spend the day with everyone. I never used to like ham as a child, but now I find it delicious. This looks like a great recipe, with a new twist on flavor. I haven't even thought about Easter too much. I just thought about St Patty's Day when I woke up. Travis went right away to get the stuff he needed for corn beef and cabbage. Sure looks like an interesting recipe. I have not tried cooking with rhubarb although I was able to try some rhubarb jam. I will try this recipe, which I know my family will love. This looks so yummy. We love eating ham. I think it's a great Easter food. Thank you for sharing. I'll be keeping things low-key this year as well... spending Easter all by myself. I know, it's so depressing. What! You can't spend it alone. Where's Angie going? Nothing wrong with store bought! I may pick up a few store bought pies myself and call it a day. I hope your daughter has a blast a Disney! My cooking blog is in Spanish with google translator. Sorry i personally cant eat pork. But you never cease to amazing me with the wonderful ways to incorporate honey into dishes.